I am very pleased to be interviewing Juilene Osborne-McKnight, Director of the Communication Department at DeSales University where she teaches Journalism, Creative Writing, Celtic and Native American Mythology. Juilene is the author of four Irish historical novels: I am of Irelaunde, Daughter of Ireland, Bright Sword of Ireland and Song of Ireland (MacMillan/Forge). In addition her poems have been published in many literary journals. 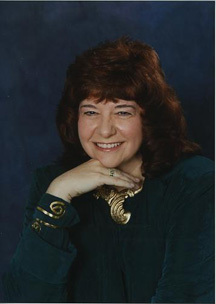 Hundreds of her articles have appeared in newspapers and magazines. Juilene was one of The Write Stuff’s first presenters…back in the day…and we’re pleased to have her back again to present the workshop, Character Intensive. Juilene, you seem to write in various forms: nonfiction, poetry and fiction. What is your favorite? For novels, I require long blocks of time; generally I will write for four to eight hours in a sitting. For that reason, I tend to work on novels during the summer and during Christmas break. I work on poetry, essays, articles and photography during the teaching year. Truly, I enjoy them all, but "disappearing" into a novel is completely transportive for me; I go to that time or place among those people. So writing a novel is even more wonderful than reading a novel, if that's possible! Song of Ireland will be coming out in a new edition. What made you (or your publisher) decide to do that? MacMillan decided to release them as e-books for Kindle, Nook and iPad. Following that decision, they decided to release Song of Ireland in trade paperback with a completely new cover. Many of my books are taught in Irish Studies programs, so I think that the decision will be wonderful for Song of Ireland. I would be delighted if the previous three were re-released in print as well! This is the most common question asked of authors but I have to ask it anyway—because I know it’s a great answer. How did you get your idea for your first Irish historical novel? This is so strange, but so true. I was living in New York, very close to the Hudson River. On a rainy November morning, I was driving to Sears to pick up a ceiling lamp. There were low bushes beside a stone wall next to the Hudson River - all of it shining gray in the rain. A small plastic bag had become snared in a bush and it was filling with wind. The billowing white caught my eye and I turned my head to look at it. Instantly, I saw a woman standing behind a stone wall, her white dress billowing in the wind. Huddled beside her in the wet grass was a barefoot child. I got the lamp, drove home, and wrote all day long! I understand you’re venturing into the world of ebooks. Why did you decide to do that? What do you think is the future of ebooks. i-books. As long as people can read your stories, you are still "alive" as a writer. So I was thrilled to go into e-book format. Will you be writing more historical novels? Yes. I just finished an Urban fantasy with historical elements and I'm currently writing the second book in a young adult series that has a wonderful historical story woven into the modern world. I'll also be writing a novel based in Roman Gaul. The people that Julius Caesar called the Gauls were actually the Celts of Northern Italy and France. You will be a Teaching Professor in Rome this fall. Can I stowaway with you? Seriously, why Rome? Why not return to Eire? You can't believe how many people have offered to schlep my luggage, translate my Italian etc! I have been named director of our University's Rome Study Abroad program for Fall of 2013 and I actually will be teaching a class called Rome vs. the Gauls. I'm expecting a full Celtic novel to grow from the experience. One of the delights of the program is that my students and I will be attached to a pair of archeologist/historians who will teach us the history of Rome from, for example, beneath the Colosseum. Rome on foot! I can't wait! With your vast background in writing, why did you decide on a workshop on characterization? I'll tell the absolute truth here; character intensive was the workshop that was requested!! It's all planned and ready to go at this point, and we are really going to have fun! I can't wait to teach it because I'm expecting to learn a lot from everyone in the workshop as well. Any words of wisdom for all the writers who are hoping to one day to have their works published. I think this is really an interesting time for writers. The decline of big publishing, the rise of small and micro-publishers and the wide river of e-publishing has given us opportunities to control our own destinies in some very new ways. Plus, indie bookstores are predicted to grow! It will take a few years for the norms of this new world to solidify. While everything is so free-for-all, the writer who tells good stories, analyzes the new world of publishing, and learns to use social media avenues effectively, may very well rise from the slush pile. Take heart fellow scribblers; a new world is upon us! Great post! That was interesting.I like your quality that you put into your post.Please do continue with more like this.